Talking to a friend of mine yesterday on the phone really brought it home how different a lifestyle we lead. He was getting ready to go and watch a football match, I was getting ready to go outside and begin the daily rounds of the animals. He was talking about the central heating, I was telling him about fetching the logs I had chopped. It was strange listening to him hearing how important it all was, his devotion to his team as important as our devotion to our animals. I suppose everyone focuses on something to give them a sense of meaning. Today was one of those rare days where, as we both have colds, I wished we were more like River Cottage with a team of gardeners and workers to go and do it all for us. But once we ventured out into the chill the animals soon took our minds off how grotty we were feeling. 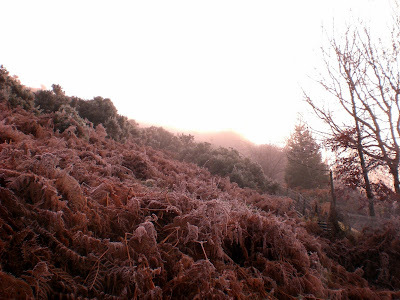 The sun forced itself through the fog and revealed some startling colours on the hill. By mid afternoon we were almost finished and the cold cure was wearing off so I headed indoors as Tracey fed the rabbits. A voice from outside alerted me that strangers were in the yard. Not quite strangers but a strange man, Mad Keith was at our front door, as he was fully clothed and not visibly armed I went out for a chat. He was after a favour, now this was a first, the techno hermit has only once ventured up our lane and that was on an out of control motorbike a couple of years ago. Asking for help was visibly hurting him but the seventy year old hermit was clearly suffering from the cold, was there any chance we could get him a bag of coal he wondered. No problem, come in and have a coffee first. He stepped inside the cottage and his jaw dropped "I've never been in here before" he whispered taking off his cap and clutching it to his chest "Its massive" he breathed as wandered around the living room like a pilgrim in a cathedral. As he lives in a seven foot by seven foot space I suppose the ground floor of the cottage does take on a new perspective. Coffee made we sat and chatted. Mad Keith wasn't happy, the council wanted council tax off him, first time in 43 years, he had been banded group A and that was a lot of cash for a hermit to find. For a while now he has been writing to them asking why now, but the bureaucratic machine seems to want to squeeze the blood from his particular stone. Maybe as revenge for not being able to evict him from the hill in 1992. I drove him to his shed to get his wallet, Rene just managing the 1 in 4 grass slope that this pensioner cycles up and down daily. He came out of the shed with a can, could we get some petrol too? Images of him trying to light coal soaked in petrol in a wooden shed were banished as he explained he wanted it for his chainsaw. The prospect of him armed with a working chainsaw was equally worrying but slightly more acceptable so I took him and his can to the nearest forecourt. Hermit smalltalk involves ignoring any questions asked and sticking to a subject totally unrelated to the one under discussion. So I obtained his views on the weather, the council, the credit crunch and foreigners. All were despised with equal passion, the credit crunch because he was bloody sick of hearing about it on the radio. Asked if he had ever been abroad he looked at me like I had just asked him if he liked eating babies, "Never, No! Never!" he rasped. "You have a radio Keith?" I asked steering the conversation back to safer ground. Now I did know he was a modern techno hermit, having a mobile phone, but what I didn't know was that he was wired for sound! His shed has electricity! Three years ago he bought a generator "Undred and seventy quid it cost!" and since then he has had electric. This powers the battery charger for the radio and mobile phone. But it doesn't work anymore, stopped yesterday, don't know why, wouldn't start, buggering thing. We got the fuel and coal. For a moment it looked like there would be murders when the girl at the checkout asked for £2 more than he had bargained for, but as he had not bought coal for over a year her mistake was understandable and the queue breathed a sigh of relief as he shuffled through the door. I drove up the hill to his shed and carried the coal to his door. Did I want to see his generator, well theres an offer you don't get every day and one I couldn't refuse. He carefully pulled clear some sacks and coats and there in the gloom was a shiny as the day it was made generator. He stroked it like you would a Holy relic. "I just doesn't work though" he muttered sadly. "Well I tried to start it and nothing, I was here all day pulling, nothing." He shook his head and patted the silent genny affectionately. I avoided the double entendre trap and pressed on. "When did you last have it going?" I asked hoping to gain an insight into the demise of the brand new looking contraption. He looked up at me, "Let see now, it was when I cut the hedge, I needed the trimmer"
I looked at the nine foot high wilderness type foliage "When was that Keith?" "Spring" he resumed stroking the silent machine "I don't use her much see"
"Has it, er she got petrol in it, her?" seemed like an obvious question but one that needed asking. "Yes Petrol" I pointed to the can and the filler cap as he ran a gnarled finger along the words Petrol Generator. "She takes petrol do she?" I topped it up from the chainsaw can while he watched attentively. He pressed the switch and pulled the cord. The generator spluttered into life and hummed along providing a backtrack to Keith's wild celebratory jig. He stopped "Why do you think she didnt work yesterday?" he asked and shook my hand and before I could answer he said, "What do I owe you?" "Nothing Keith, glad to help" I said climbing back into Rene and heading home. As I bumped along the track returning to my warm cottage, my lovely wife and a mug of mulled cider not for the first time this weekend I realised how different my life is and how lucky I am. Guess who's found the fox pooh! Anyone wanting to keep goats should think long and hard about it, then go and seek medical help as you do need your head examined. No sane person would put up with their antics. This is just one morning with Maggie and Geisha. First they tried to eat all the lambs food. 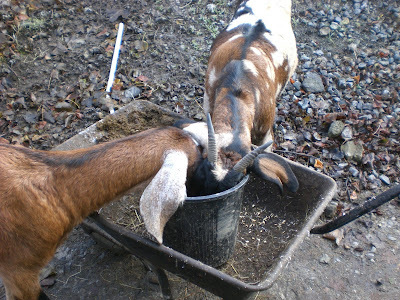 Then they knocked over the poultry feed bucket and had a second breakfast. 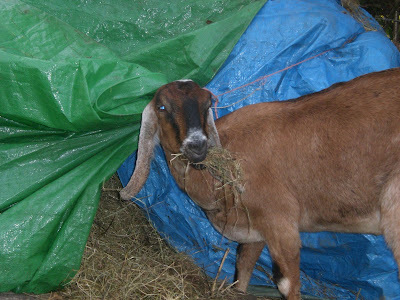 Having been chased off from the hay put out for the sheep Maggie doubled back and stole Trevor's breakfast, at the same time claiming the bale of hay put out for Apollo who is in the background looking most put out. So why would you keep goats? Tracey and I thought we might have a lie in today, the animals had other ideas. Both of us are ill with colds we just can't shift so neither of us felt like getting up and getting on with the day. As we were feeling sorry for ourselves waiting for the cold cure to clear our heads and stop the aches our animals had other concerns, like where were their breakfasts. 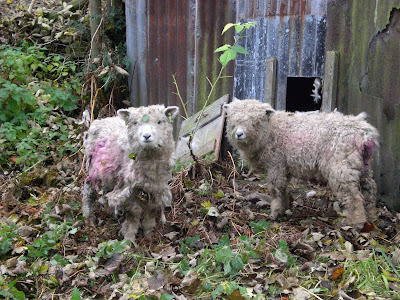 A new rule of smallholding, don't be ill. Not at the same time anyway! Don't they let you down! Amongst the chaos of last nights routine, not long after I ran along the lane in the dark shouting obscenities at the fox and tripping over enthusiastic but useless as fox deterrent Bernese Mountain Dogs, I walked past the remains of the haystack. 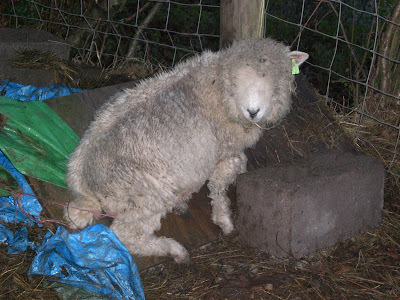 Daffodil, our only surviving bottle fed lamb, was curled up all cosy amongst the tarpaulins and dropped hay. The gave a small bleat of acknowledgement as I stumbled past in the darkness. I almost paused as I wondered if she would be safe from the fox, but as she was only metres from the front door and overlooked by our bedroom and therefore in easy range of the gun I considered her safe. This morning, a beautiful frosty clear morning and I opened the window wide and drew deep lungfuls of freezing cold air. It was a good morning. All was right in my world. I looked across and could see Daffodil still in position on the haystack, she looked so cute in the frosty sunlight, the ice glistening on her fleece. So much so I even commented to Tracey that the fat lamb was still tucked up in her bed. About halfway through the morning feed routine I could see why she was still there, and as you can see from the picture above she was not going to go anywhere without the aid of a sharp knife having tied herself up in the tarpaulin strings. 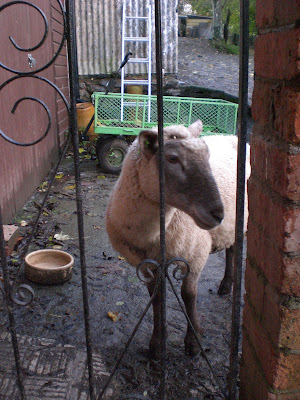 The poor thing had been trapped all night, big guilt trip from this part time shepherd. She had even managed to tie one of her ears to her head. Stuck so fast even Houdini would have had trouble escaping! Given that the magnificent seven were on patrol seconds before we were surprised to hear the very worrying sound coming from the copse at the side of our lane. Now for those new to this site the magnificent seven are a pack of dogs who enjoy the life of luxury here at Rock HQ. 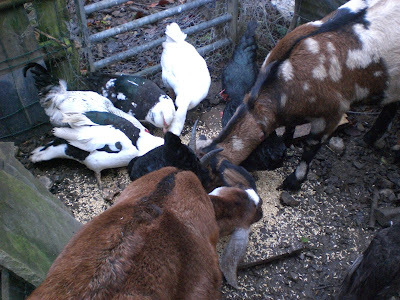 Here they have everything to meet their needs, from stagnant ditches to sit in to a choice selection of pooh to eat or roll in. Poppy the not so golden retriever pictured above having rolled in the very freshest fox pooh had been in the cauldron at the end of the lane, the two Bernese Mountain Dogs sat and watched as Tracey and I, illuminated by lights with enough power to pick out enemy bomber formations in the night sky, cleaned out the horses latest offerings before providing them with their dinners, Faith the Gordon setter ran at 100mph from one end of the farm to check if all was in order to the other to check to see if anything had changed since she had last been there some 30 seconds before while the two ancient Beagles grubbed around trying to find anything to eat that the other animals had overlooked. Pip the mental collie cross chased her tail, cats, shadows, the wheel barrow and Faith. All in all it was a normal night time routine taking place at Rock HQ. 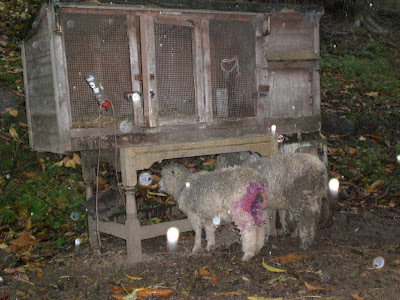 With all this mayhem and activity taking place you might have thought that the most reviled animal of the smallholding would have kept well away. But no, within two seconds of the lights being turned off and the dogs running through the front door a female fox called her mate from the copse not fifty metres from where I was standing. Five shots from the gun and all went quiet. We knew we hadn't hit it, they were blanks, but Mrs Fox doesn't know that, at least I don't think she does. Goats have a reputation for eating everything, they don't, but they do try everything. Maggie has taken this rotten gourd from the compost. She seems to like it. Seeing a big pile of horse pooh doesn't normally make me happy, our horses produce a vast quantity every day. 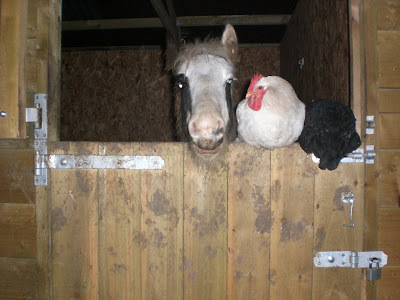 Apollo, pictured above saying hello to a mutant two headed horse, hadn't produced his usual wheelbarrow load. He was happy enough, eating, doing a passable impression of Monty Pythons Mr Creosote, eating and eating and by the looks of his stomach he was about to explode. 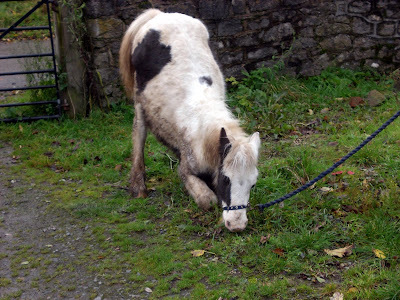 Suspecting colic I walked him up and down the lane, then tried to get him to run in an effort to shift the obvious blockage. Nothing happened. He was wormed, we were sure he hadn't eaten anything he shouldn't have, just that he had eaten a lot and had trapped wind. No need for a vet, what this horse needed, my beautiful wife informed me, was a good fart. We shut him up for the night and walked back to the cottage. A sound like a jet engine warming up emanated from the stable, Apollos blockage had undoubtedly cleared. I think its a sign of the high esteem Tracey holds me in when as the rumbling sound died away she turned to me and asked "Was that you?" A Day of horrible weather, either bitter cold winds or drenching rain caused Daffodil to take cover once again under the spare hutch. She is currently wandering the smallholding all alone as the rest of the Ryeland lambs are housed in the old chicken shed as they have lost much of their wool. Tracey has made some temporary arrangements for them, yes you've guessed they have their very own wooly jumpers. Photos to follow! The mud at Rock HQ is beyond a joke now, goodness only knows where the forty tons of gravel went to that we put down to deal with the mud bath winter inevitably brings. Every time the dogs go outside they gather several pounds of dirt in their fur which they proceed to leave at strategic points back in the house. Favourite spots include the sofa, the clean washing, any coat they can knock on the floor and all painted surfaces that they can lean on. Places they conspicuously avoid until they have smeared the worst of the muck off are their dog blankets and beds. Faith is like this all the time, always on the go at 100mph, never still unless she is asleep, at least she is a happy dog! Its cold and wet out here! Like the proverbial drowned rats! They didnt take much encouragement to get back indoors. First indications it was going to be a trying day at Rock HQ was waking at first light with a pounding headache. First I thought this was caused by drinking too much of Mr20%'s vintage port last night as he and his lovely wife Annie had invited us round for dinner. As Tracey also had a bad head the source of my discomfort was actually me catching Man Flu, a tougher version of the slight head cold that she has suffered from for the last 48 hours. This hideous disease has rendered me incapable for most of the day and meant that instead of rushing about the smallholding looking busy I have had to lie on the sofa and watch rugby, a torment only made bearable by a seemingly limitless supply of Pepsi and pretzels. Tracey went into town to fetch these very necessary aids to my recovery. Whilst she was out the goats sensing my vulnerability ate through the TV Aeriel cable thus forcing me into the Siberian like weather to effect repairs. 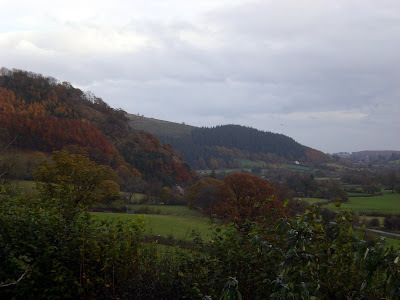 As Tracey drove along our drive she saw that there was a gate open from the farmers field onto our hill. This was significant as the gate had no reason to be open and there are times when one of the local militia goes a bit stir crazy and wanders the hills opening all gates and mixing up the livestock. Pondering the likelihood of this she saw as she rounded the bend she saw three strangers with one of those huge builders rubble bags attacking the holly tree. The Oracle was in his yard so she asked if he knew who they were. You may remember if you follow these tales the Oracles reaction to me taking apples a while back, he finds it hard to share natures bounty, particularly with ne'er do wells and hippies who seek to profit from the free gifts adorning the trees and bushes of our hill. With a battle cry that perhaps should have been better thought out "Oi! Get yer dirty hands off me bush" he and his pace maker set off at a blistering pace up the hill to remonstrate with the holly thieves. Tracey followed in case he needed CPR or the miscreants needed protection. Somewhat startled by the rottweiler like response to their activities the three explained, or tried to, that they had been given permission by one of the local militia to take the festive greenery. This was immediately challenged by The Oracle who demanded names, dates of birth, lineage, car details and the situation almost spiraled out of control when they declared they planned to sell their ill gotten gains. By now they were totally clear over whose holly it was, definitely not theirs and with the universal placation of "We don't want any trouble mate" they fled through the open gate and across the field to the sanctuary of the farm across the way where they had allegedly given permission to gather. It took a while for The Oracle to calm himself after the encounter and he strutted back and forth like an angry cockerel recounting previous battles where he had cut the bags of gatherers he had hunted. The Oracle is a very generous man, and if you are lucky enough to encounter him on our hill don't take liberties with his bush. The Ryelands are on Oak Bank at the moment and there is not much for them to eat so they are getting a bale of hay to share every other day. Its a good natured communal breakfast with ample room for them all to tuck in. Not today though, the goats have joined them and whilst Geisha is quite happy to take a helping from outside of the field and so not interfering with the sheep, Maggie has decided that its all hers. Nature abhors a vacuum, a position held by Aristotle, and later Galileo in their efforts to find a fitting explanation for the operation of hand primed water pumps. Obviously these boffins of days gone by had little to occupy their time, like TV, stamp collecting or trainspotting and their idea of a good night in was fiddling with their water pumps and pondering why water filled the space where once there was air. This phrase may also be used to explain why now, when the goats are carefully shut away so I can navigate through a sea of treacherous mud laden with animal foodstuffs unhindered I suddenly find myself tripping over, getting jumped on by and other ways annoyed by a a very bothersome sheep who until this moment in time has done little to try my patience. Quite why she has had a personality transplant is beyond me but Meg the Suffolk Cross is doing her best to be voted "Most likely candidate for Mr Whirlpool" (the freezer! )with her current behaviour. So determined is she to be the first to sample the bucketfuls of the feed mills best offerings she has taken to guarding the gate so that from the moment I step out of the front door she can harass me. I stood for a while in the furnace like glow of our anti aircraft light on the end of the stable tonight. In the circle of light three horses ambled around picking up leaves, seven dogs careered about picking up choice pieces of horse pooh, two Ryeland Lambs stood shoulder to shoulder amongst the chaos whilst Budge the Cockerel tried to round up his three wives who had scattered when the horses were released. I should have been cleaning out the stables, instead I was thinking over the events of the day and pondering on what might have been. Today was check up day at the hospital, so I was subjected to the dubious care of the nurses who look like they wandered off the set of Royston Vasey, I swear three of them are related to Tubbs from the Local Shop.Having got there early my heart sank when within minutes of my arrival I was told they were one hour behind. By the time I was summonsed for my audience with the great man himself, Mac the Knife, my surgeon, they were two hours late. He was his usual modest self and congratulated us on our achievement in repairing a hideous injury. I was tempted to point out that my contribution far outweighed his 8 hours knife trickery and subsequent follow up checks and operation. I let him sing his praises as he pointed at key points of the latest x rays which rather pleasingly showed a huge amount of bone growth, my arm it seems has joined together. "Whats stopping my arm from straightening?" He paused for breath and regarded me over the top of his glasses. He gushed about fixing an impossible break, most people don't present an injury like mine, remember they nearly lopped it off, he jabbed excitedly at the x ray, this isn't how we fix arms, this was cutting edge, seat of your pants surgery, these bits of metal aren't supposed to be used this way, in fact they are the wrong bits, had they waited for the right bits it would have been too late, some of these bits are inside the bone pinning it together never to be removed, the big bit, well lets not be hasty, leave it, what, six months and then he will take it out but its a major operation. He went on to tell me how they would have to flay all the muscle out, split it right down here, across here and had I not been of sterner constitution his graphic description would have made me feel quite ill. At least I now knew that the pain was caused by the metal. There was silence. I realised the great man had asked me a question. "Why did I want to straighten my arm anyway?" I mumbled something incomprehensible about reaching stuff, a weak argument totally destroyed by his letting me know that very little human activity requires a straight arm, and if you want to reach stuff stand closer, he would advise using a ladder but given my demonstrated ineptitude perhaps not. "I think we've done a good job. My advice is be happy with what you've got, you nearly lost it. "he finally said. Back at Rock HQ with Tracey, Beth, Ben (currently in Cyprus) and our animal companions its true, I am happy with what I've got because when I fell I so nearly lost it. Looking a bit frayed around the edges these two scruffy individuals are recovering from their traumas in the derelict remains of the old chicken run. Bonny on the left, Sandy on the right are both doing well, both still losing their wool from the shock of the mauling they had off foxes, but seeing as a few weeks ago Sandy was literally knocking on Deaths door they are doing a lot better than I expected, putting on weight and enjoying their new surroundings. 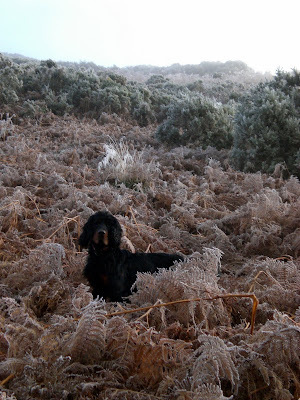 As you can see Bonny is doing her best to blend in with her surroundings. In my haste to recount the tale of alien para gliders yesterday I forgot one important point the militia man made yesterday, that he and his father had thought about buying our des res years ago for the measly sum of £500! What stopped them was there seemed to be a dispute over who owned the fields that came with it. He also remembered a time when there was a roadway past our HQ and around the hill, he clearly remembers coal lorries struggling up the lane. He was also the unfortunate gardener that Maggie set about when we were stealing apples for the pigs a while ago! I didn't own up to being the mental goat owner, the goat being mental, not me that is. I have only ever known one other place in the world where people stop and tell you their whole life stories other than here in our valley. That was in the Outer Hebrides. For reasons too complicated to explain I took Ben and Bethan up to the far flung Isles to experience the Highlands and Islands in 1992. We lodged in a small village called Balallen, south of Stornaway and were very quickly welcomed into the community. Every one knew every one else and nobody did anything without everyone being involved. A real sense of community and a real need for alcohol to take your mind off the fact that you were marooned. Trapped. Unable to go anywhere unless the ferry took you. It was quite an experience. As we were "incomers" we were fascinating to the locals who just had to get to know us. I soon learned not to be in a hurry as peoples need to get to know us always slowed things down. Simple things like posting a card took an age as the postmistress needed to know all about us and who the card was going to. Then she would hand me my letters and ask who they were from and was it good news and so on. We got used to the weather, the storm force winds rampaging over the isle, with nothing to hinder their progress they rushed in from the Atlantic and unleashed their fury on the small crofters cottages. When the wind didn't blow you off your feet the midges devoured your flesh, to live there you had to be a hardy soul. And yet we met people who had lived their entire lives in the same bay, never having ventured past the end of their track. One happy soul was our neighbour. 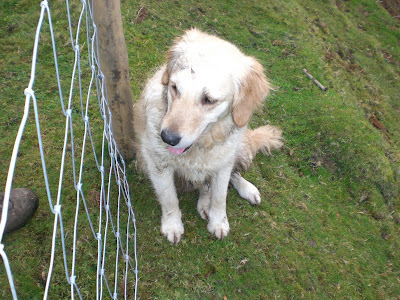 In a lull from the winds and just before the midges became airborne we swapped life stories over the chain link fence. He had considerably more stories than I on account that he had lived nearly three times as long as me already. A nice jovial chap, the islands best mechanic it turned out, he had retired the year before. He had been in the army, during World War Two had been a lorry driver and had driven his truck four times across India ferrying supplies the long overland route to our troops. He had survived all sorts of hardships and at the wars end got on a troop ship to come home. The long trip home was broken by a short spell in Indonesia where he and all the troops with him were given a choice, get back on the ship and go home or get on the ship in the next berth and go to start a new life in Australia. He came home to the Outer Hebrides and worked in the village garage for the next 47 years. It was fantastic on the island, he met and married his wife, they had two children, he had everything he ever needed here. He smiled at the memories and we stood in silence looking out over the beautiful but barren windswept landscape. A few midges began their sorties and it was time to shelter indoors before their attention became too painful to bear. As he turned away from me I asked "Ever wish you had got on the other ship?" He stopped halfway down the path and beamed at me "Every bloody day!" he shouted as he waved goodbye shutting the door. If you venture along our lane and are spotted by the magnificent seven you are in for a rowdy welcome, and if we see you the human inhabitants make a point of saying hello. Today we were enjoying the peace and quiet of the country, watching the horses idly munching the grass, listening to the birds and marvelling at how still and peaceful it all was. Standing doing nothing is a hazard of smallholding, its so easy to just lean against the gate or fence and gaze at the wonder of it all. 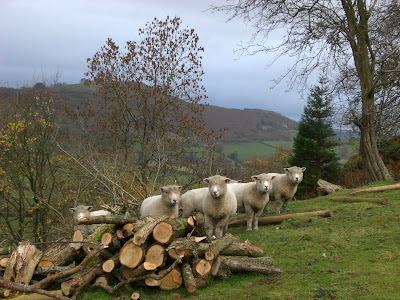 The fact that the huge pile of logs you are stood by needs moving, or the pile of branches needs sawing, or the fence posts still need hammering in, or the sheep need their breakfasts before they die of starvation seems to fade into insignificance, for a while everything just is. Reality returned with the magnificent seven letting rip so shattering the calm. From our vantage point up in Willow Rise we could see what looked like a local militia man scurrying along the track with a collie on a string. Both were doing their best to evade the attentions of our dogs who from the safety of the other side of the fence were doing their best kill maim disfigure impressions. They stumbled into the swamp as I called the baying pack to heel. Most did their usual ignore him routine and once they had decided the unfortunate militia man and his dog were muddy enough, welcomed enough and by the looks cross enough they scarpered. I apologised. No need said the militia man, nice horse he continued pointing to Apollo (obviously this militia member has good taste choosing Apollo over William) I got nine of them he added, and donkeys. A distant braying donkey emphasises his masters point. 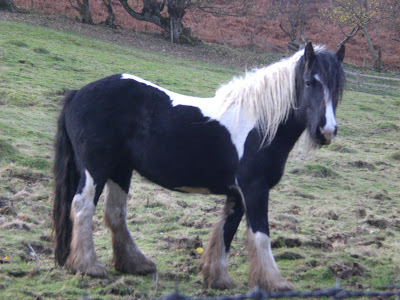 We got talking, he was called Steve (uncanny) and he, it turns out lives on the next hill along, has done for so for over 30 years and took over his small farm from his father. Does all sorts now, got to to make ends meet, chainsawing and fencing. I looked at my efforts going on in the field behind me. So was he, he looked impressed, at least think that's what his pointing and laughing indicated. He wandered off up into the hill looking for his sheep, he was missing six, we are missing three, neither of us think we will find them but we hope they are not pie fillings. As soon as the magnificent seven got over that excitement they went apoplectic when a strange looking vehicle advanced cautiously into the yard. I could see two very worried looking passengers checking the doors couldn't be opened as the magnificent seven tore round and round their silver spaceship like camper van creating an insane canine merry go round. With order finally restored, mostly by locking the dogs away a door to the silver camper finally opened. Tracey and I stood silently as the alien tumbled out, he smiled, we smiled, before he could tell us they came in peace I asked if they were lost as they surely were. No. In fact they knew where they were, right down to naming Rock HQ and the hill, no they were in the right place, they were para gliders looking for the launch site. This sounded interesting, so I showed him the hill, the other alien wouldn't boldly go where dogs had already been and sat gripping the steering controls as I took his co pilot into the cauldron. He took his bearings, I gave him as much information as I could, this was good, our first para glider, much better than the usual archaeologists, ramblers and orthodox Jews that wander into our yard. We returned to the mother ship where the pilot had managed to turn it round without vaporising the goats, sheep, assorted poultry and dogs who were plotting a second assault. Having established that this was not the place for over 20 like minded para gliders to descend, mainly due to lack of parking and the long and boggy walk in the alien took my advice and planned a trip to the dark side of the hill where with care a vehicle could make it to five ways crossing. We shook hands, as he got in his craft he said he couldn't believe we hadn't seen more of his kind here, its on all the maps, an ideal spot in the summer, ideal, what on earth was it that stopped people coming here. At that moment the dogs had mastered the combination locks on the kennels and launched phase two of the welcome. Slamming the door to prevent another close encounter they sped off, perhaps the alien got an inkling as to why our lanes usually so quiet. I spent part of the day exercising the horses today. I had intended to walk all three of them around in turn, for lots of reasons, they are spending a lot of time inside at the moment as its so muddy so it would do them good was one reason, another is because the date has been set for our Offas Dyke trek next year and if I am to complete the 176 miles in less than a week I have to be a tad fitter than I am at present. Yesterday we had a baconrollathon at work in support of Children in Need, this entailed Tracey and I taking a large piece of bacon into work and cooking all staff and visitors bacon rolls for which they made a contribution. We raised £40 and everyone enjoyed the bacon, except for our resident vegan who contributed anyway. This did mean though that I had access to too many calories, having an abundance of bacon rolls and crab apple jelly proved too tempting and I indulged in breakfast, second breakfast, elevenses, early lunch, late lunch and afternoon tea. My commitment to ridding the world of bacon rolls only ended when I drove home and did the evening rounds. 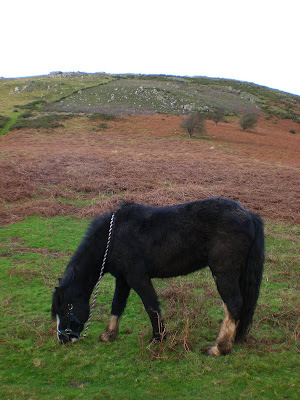 However, scoffing bacon rolls wasn't the only reason I needed to exercise the flab off on the hill today. Last night we were invited to dinner over at Robin and Jenny's. The food and company was excellent but special mention has to be made of the Blueberry and Mango pavlova that Jenny had made for pudding. It was just fantastic, the crisp meringue shell gave way to a mallow soft centre, the fresh fruit and cream, the thing was massive and to my shame I ended up having three servings. All this was washed down with beer, wine, port and whiskey, such over indulgence has a price to be paid, which was three times around the hill. 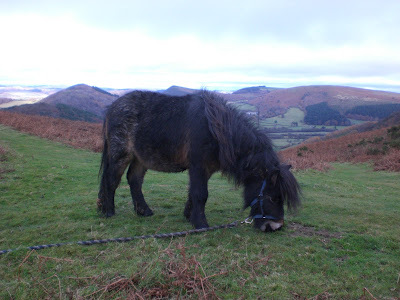 William dragged his hooves all the way around, taking ten steps forward, two back, he had to be persuaded, coaxed, cajoled, shouted at, dragged, pleaded with almost every step of the way. It took nearly twenty minutes to get along sheep skull lane which is only three hundred yards or so. Goodness knows what got into the stubborn beast but he would advance slowly then gaze off into the distance with a sad expression, every now and then he would whinny. I couldn't tell if he was shouting for help, calling to any other horses on the hill to get this madman intent on exercising away from him or trying to answer the mechanical digger noise that drifted in on the wind every now and then. Whatever it was William turned the forty minute journey into an hour and ten minutes. It took so long I almost missed a surprise visit from the Stable Sprite who called in for a coffee and a chat about butchers. Trevor, on the second circuit was completely the opposite, the pocket rocket never walks anywhere. I followed in his wake holding onto a long leading rein for dear life rather like an out of control water skier following a boat. Every now and then my yanking on the rope persuaded him to halt briefly which would give me just enough time to regain my balance, steady myself and catch him up before he set off at high speed giving me whiplash injuries as the slack created in the rope suddenly disappeared. When I got back I looked like I had been dragged through a hedge backwards, which was a pretty accurate description for of parts of the journey. Williams circuit was too slow, Trevor's circuit was too fast, which means Apollo's circuit must be just right. He set out with grim determination, straight for the haystack, which was where he stayed happily munching instead of being frog marched around. As far as I was concerned unlike last nights pavlova you can have too much of a good thing. Twice was enough! Given the temperament of the teeth owner I bet teeth! The battle of the carrots continues! 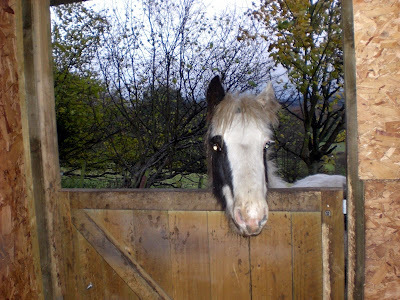 Apollo just about to panic that he is the wrong side of the stable door to get his breakfast! Can anyone see a potential problem here? Maggie does this but as she has horns she can't get out as easily as Geisha! Today is our wedding anniversary and as a special treat for having put up with me for another year I took Tracey to the pub on the proviso she paid. We didn't go to our local The Harp as whilst it is a special occasion and it a very special pub its prices reflect the specialness. The cheap pub up the road closed due to lack of interest so that was out so we took a detour into town on the way home to try a not too bad pub we had eaten in last April. As Rene chugged up the hill it was obvious it was shut. Damn! Now where? We headed back along the bypass, take away, no thanks, Rene navigated the side streets, a huge black and white building was illuminated in the headlights. The Oxford Arms Hotel. A sandwich board outside proclaimed an all new menu. It was also shut. Abandoning Rene to his fate outside the chip shop we walked back the the hotel. A4 pages in the windows told us that they now cooked on Monday nights, so Wednesday was bound to be a winner, but no opening times. It was only 5.45. It was then we discovered another advantage of living out here in the sticks, where pubs are owned by Landlords keen to please the punter, I phoned the Hotel. "Do you cook on a Wednesday?" "What time do you open?" "Hang on I'll let you in"
As I hung up the lights came on and the pub opened. A very lively Landlord couldn't have made us feel more welcome and soon we were waiting for our meals sat by a log fire. He established we were locals, we established this was his first pub and it seemed to be doing well. We asked about the menu, he sang the praises of his chef and told us he ate his cooking all the time, we sang the praises of his beer and we had a jolly time. The food was excellent, just pub grub but huge portions, cheap and didn't involve washing up. The Landlady joined in, we complimented the pub, the chef, the atmosphere, she thanked us for coming, was glad we liked our food and would look forward to seeing us again, a couple at another table told us how much they enjoyed it there, regulars, the food was so good, we agreed and again complimented the chef. The Landlord almost rebounded off us as we opened the door, he had been outside on an errand. He scurried past looking sheepish and bolted into the kitchen clutching a white plastic carrier bag. The Landlady smiled at me. I smiled back. "He was he carrying a takeaway wasn't he?" I said. Its good, but not that good! You might think that Apollo is kissing the ground after surviving some hideous ordeal, or perhaps he has found his god and is praying, maybe some horse royalty is passing and he is paying homage or that the grass is so good, so tasty it has momentarily rendered him unable to stand. None of these would be accurate. He shares his stable with four Ryeland lambs at the moment and they, in their desire to become the best provider of next years lamb chops, often fall to their knees and scoop up as much food from the trough as possible. Apollo has been watching this and has adopted the technique of speed eating into his repertoire. The grass is good, but not that good! Before the weather broke on the weekend we got around to venturing into the local town. Its a strange place, one high street containing weird shops aimed to cater for the needs of locals and tastes of tourists. Hence old fashioned grocers and game merchants sit alongside curiously decorated emporiums displaying everything from hand made chocolates, silk scarves and the strangest sculptures fashioned from broken pieces of painted driftwood. What relevance they have in a landlocked province like ours or why anyone would part with their hard earned cash for one is beyond me. Each to his or her own however and each time we go into town we do make some interesting discoveries, like a book shop selling the latest "How to..." guide, a must for any wanna be smallholder, a toy shop that's really a sweetshop that's really a cafe, a junk shop which doubles as a tattoo parlour (I've no idea how or why the two are linked, and there are some strange tattooed people wandering these hills)and a newsagent pet shop odd job man at your service shop. So diverse are some of the boutiques I am convinced that the gentleman's outfitters will be staffed by a chap in a fez and should you try on the latest tweeds offered for sale as you leave the fitting room you better be prepared for an adventure a la Mr Ben! On this latest sojourn to civilisation, as is usual we found a shop that we had not seen before, despite having walked past it dozens of times we had failed to notice the pretty green blinds and canopies with smart gold lettering of the totally organic delicatessen hardware store. Here you can get everything from half a pound of six inch nails to 200 grammes of the finest spices the world has to offer. So convinced were we that this was a new shop we argued our case whilst sampling some goats cheddar and testing the ergonomics of the latest belt sander. The very nice and exceedingly patient lady serving us was gracious in her dismissal of our views and pointed to the established 1907 label on the probably original packing case containing brown paper bags to wrap our purchases. It was also whilst in this fantastic newly discovered old shop that I realised how much of a liar smallholding has turned me into. The goats cheddar was exceptional, and as we discussed its merits, alongside pondering the benefits of round or oval headed nails the nice lady asked if we had goats. Why yes we have, two in fact. Will we be making cheese? More sampling and she totted up our bill for spices, cheese and a selection of rough and smooth sandpapers. 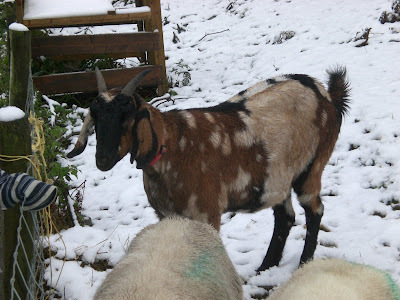 A voice from behind, we had created a queue, I used to keep goats, they're great aren't they? A nice old lady was speaking her mind. I paused, thinking about the time one got on the cottage roof and put a hole in it, the dents on our car roof, or the dents on our friends car roofs caused by goats, the damage to the garden, the almost daily predicaments they find themselves in and the chaos they create in their wake, before finally answering. Yes they are fantastic aren't they. We left before any truth got in the way of their reality. Views of our hill taken from Steve the electricians place. A different point of view. 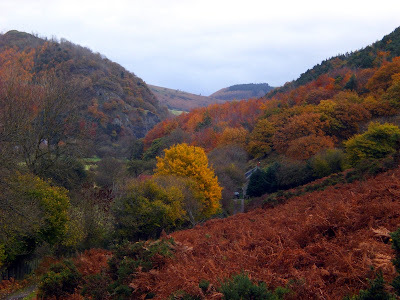 The top picture is taken about a third of the way up our lane looking down on The Oracles house, the colours of Worzel Wood and Stanner Rocks beyond are stunning. And then it rained! Weather really has an impact here. 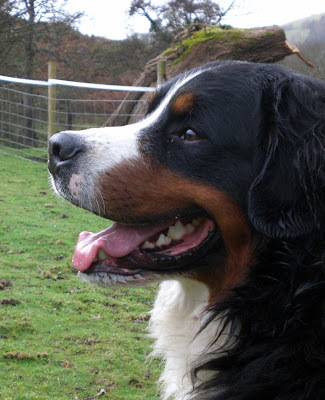 We got up fairly early as there was a lot to do, but whilst it was dry we walked over to visit our friends whose Berners we look after while they are away. The walk did the horses a lot of good, there was one minor upset when Trevor panicked because a car was parked at the end of our lane. It was under the trees, lurking, a harbinger of doom, for Trevor was right to panic, its Murpy's car, he is back on the hill so none of us are safe. There does seem to be a link between his arrival and atrocious weather! We managed to get the jobs done just as the heavens opened and we have seen some rain here but today was definitely the hardest ever, linked to the gale force winds it made being outside intolerable. Everyone and everybeast took shelter wherever they could find it, even Geisha thought twice about crossing the yard to steal food. The rain has flooded the workshop, I moved everything into the upstairs gallery, well that that wasn't floating when I discovered the disaster area. It seems the roof over the black hole has given up any pretence of weatherproofness and the water is currently pouring in. Another job to add to the list! You might think the video above shows that Geisha's has given up her raids on the haystack. Not a chance! 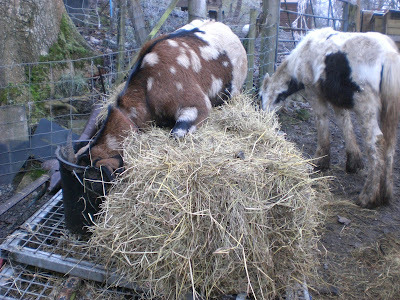 Despite it being appalling weather William and Geisha insist on helping themselves to the hay buffet. Taking shelter wherever they can Hercules and Maude are hiding under the spare rabbit hutch, it might only keep their heads dry but at least its a start! Its been a while since I posted a video of Trevor the pocket rocket in action. 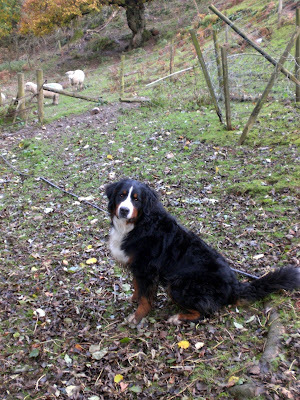 We took the boys for a walk across the valley to our friends who have Berners and Trevor took the opportunity to explore the garden at high speed! The pocket rocket is back in action! Perhaps one of the most satisfying aspects of smallholding is that it is so different from my paid job. Most of my work involves meetings, assessments, complicated analysis and predicting future events. Guess work in essence, albeit guesswork underpinned by research and theory. But you seldom get to see an end result. 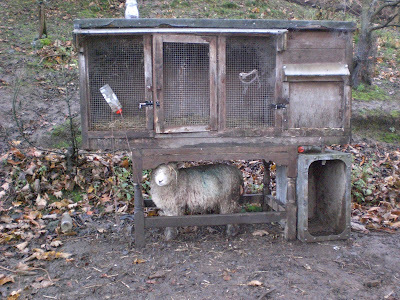 Smallholding is different. 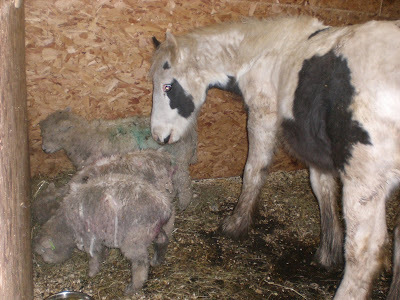 You have a job, it must be done, otherwise things go wrong or if its not done you or your animals suffer. There is a start and most definitely a finish. 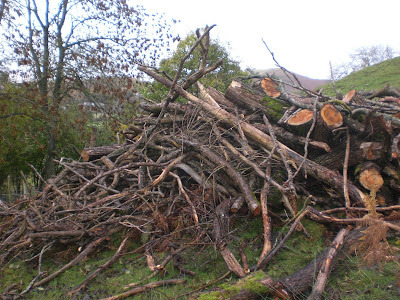 Today I nearly finished a job we started late September when we began to clear the fields of fallen branches. This resulted in a mountain of timber piled up at the end of the lane. Well today, despite the weather it has been transformed into a different pile of timber thanks to a chainsaw borrowed off Steve from across the valley. My chainsaw is still on holiday with JJ in the Bristol area. My Dad would be surprised at the satisfaction I take from cutting up enough logs for winter as it was a job I detested when as child I had to help him get the logs in. 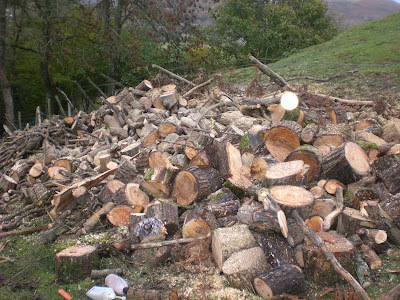 Now as its a necessity here at Rock HQ it is indeed a satisfying task and the feeling of accomplishment once the huge pile was cut to stove sized logs was marked. Now all I have to do is load them in the wheelbarrow and bring them into the dry store. That's another day. Oh and chop them up with the axe. I cant wait for William to be able to carry them for me! Should you need further proof, despite her traumatic incarceration in her dinner yesterday Geisha is straight back at the hayface. 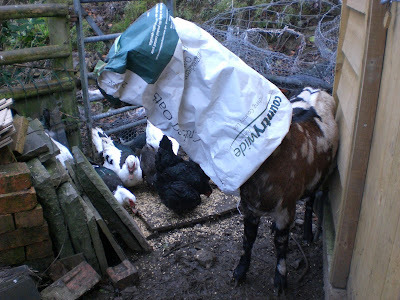 Geisha was missing this morning, we could hear her bleating but couldn't see her. She sounded like she was in the field opposite. 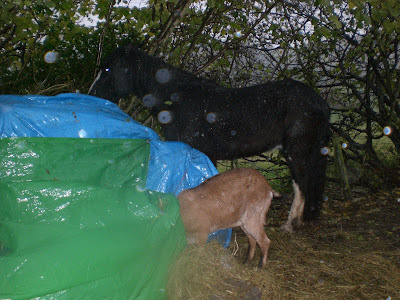 Eventually she was found, having eaten a tunnel into the haystack it collapsed on her trapping her until we removed part of the tarpaulin. 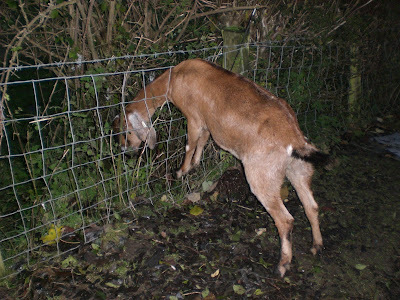 This goats lust for calories will be the death of it, only two weeks ago she was caught by the leg and hanging off the fence for around 8 hours. At least her leg is getting better. This is Cosmo interrupting me getting on with feeding the dogs by asking for the door to be opened. He is a very persuasive and vocal cat. 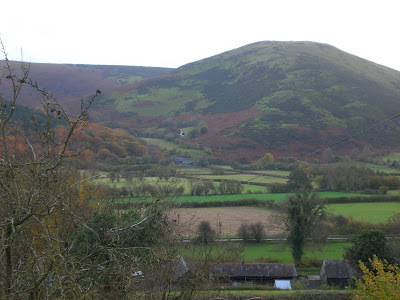 Before we took over the smallholding I used to work over 60 miles away from home, this meant hours in the car, tedious journeys, backache, bad temper and a huge fuel bill. I would be sat in my car watching the seasons change and somehow feel very disconnected from the world. As luck would have it, just after we signed for the monster mortgage and moved my job disappeared and very fortunately I got a better job some twenty minutes from Rock HQ. There are times however where work calls me away and I have to go to London or some other large city in order to fulfil my paid work role. Today was such a day and so it was important to get a good nights sleep as I had four hours of driving and the nightmare of Birmingham's rush hour to negotiate. My escape to the land of nod didn't get off to an auspicious start when the bedside light decided to play up. A sudden flash of light as Tracey and I lay in the dark alerted us to the fact that something was wrong. As we lay wondering if there was an electrical storm the lamp buzzed on and off again, something was up with the dimmer switch. I listened patiently as Tracey fiddled with the switch before she announced it was not fixable so she would unplug it. To a pulsating lightshow that would have been the envy of many a nightclub she valiantly tried to unplug the lamp. No, we would have to get out of bed and move it so she could reach the plug. I duly obeyed and soon we were spared the fit inducing strobes and replaced the bed against the wall in the dark. We settled down to sleep, Tracey commented that it would be funny if the light flashed now it was unplugged, agreeing that would be a good trick I turned over and was immediately confronted by a flashing light. For a split second my fuddled brain tried to work out why the unplugged lamp was still flashing but it was my phone, Beth just letting us know she wasn't coming home, cheers. Finally sleep beckoned. A weird unearthly noise from outside. Both of us held our breath as we tried to hear it again. There it was, a horrible screeching sound like a werewolf being castrated with a blunt pair of scissors. Louder this time. Its the goats, screaming. They were safe in the goat houses, they had food, water, shelter, no natural predator apart from me if they carried on making such a row and making that much noise they were not ill. Ignore it. They will soon be quiet. The beagles started to howl. Thoughts of dog and goat curry came and went. 4am they are still calling. Tracey volunteers to check on them, both are fine but she lets them out of the goat houses as its the only way to keep them quiet. 4.30 am we settle down to sleep. Bleating outside the bedroom window, at least one of the goats want us to come out to play. I decide against throwing things at them and stuff the pillows in my ears. 6am alarm goes off and despite it hitting the wall it still rings forcing me into action. I shower, dress, grab a coffee and go. 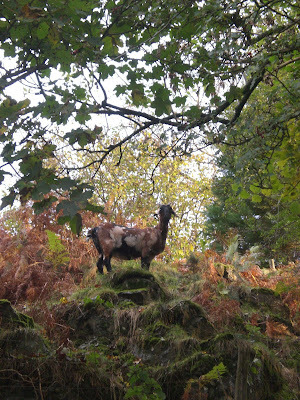 The goats, perhaps sensing my bad temper are nowhere to be seen. Tracey text me later on, she has found out why they were making such an ungodly racket. Wolves? Hungry? Wet? Cold? No none of these, they want a Billy goat, both have come into season and were calling for a Billy to come and ease their feelings of frustration. We don't have one so they have settled for Crispy the Ram and are currently bothering him, at least they are quiet now, he's taking one for the team. The evening winter routine has been adopted at Rock HQ. Venturing outside the protective glare of the sodium anti aircraft light installed on the end of the stable involves me wandering around falling over obstacles and animals in the dark or struggling to stay upright because of the mud. So my world is limited to the safe yellow circle of light that strategically covers the kennels, goat houses and duck house. It still requires negotiating Somme like mudbaths but at least you can see where you are going to fall. There is no point attempting any outside jobs in the evening other than checking all animals are still alive, fed and watered. 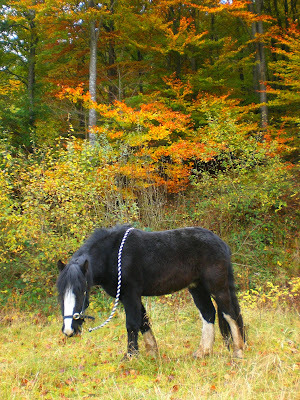 The only exception to the no jobs rule are the horses. The horses need to be mucked out twice a day, its amazing how they can convert so much quality fruit and fibre into such copious amounts of pooh. We are often asked by keen amateur gardeners if we have any to spare, well considering each horse can produce a small lorry load daily we can spare a bit. Each horse has its own way of "going", William makes nice neat piles always in the same place and is a pleasure to muck out, he takes less than a minute and he watches with interest as you carry out his number twos forkful by forkful. Apollo spreads his around with his nose so that the whole floor is covered, as is his face, this needs brushing up, or off depending on which messy bit you are addressing. He tries to help by knocking over the wheelbarrow. 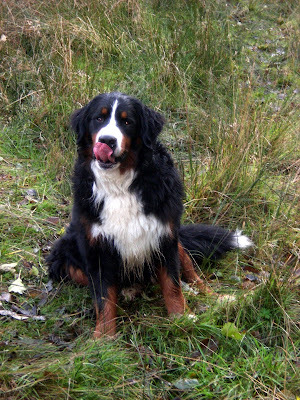 The dogs also try to help while you muck out, for some reason they view horse doings as I would Beluga Caviar, a delicacy not to be missed. The wheelbarrow suspiciously empties each time you go and collect a new scoopful. Trevor the shitland, well it looks like he makes models out of his and then he stamps all over them, he probably makes effigies of me, those he doesn't stamp on he kicks over the walls. 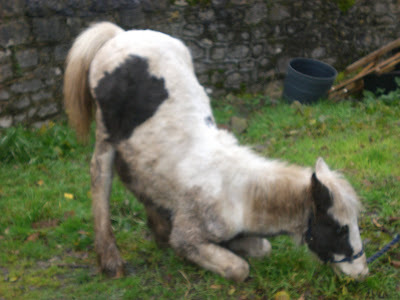 Never before in the history of horse ownership has so much mess been made in such a small space by such a tiny horse. Here you can see Apollo being mugged for his dinner by the three Ryelands he is having to share his stable with. Sandy the one closest seems to be making a full recovery. Geisha, judging by the noise she is currently making is over her accident where she caught herself on the fence and hurt her leg, she seems keen to escape the confines of the goat house and get back to bothering us as we try to feed the rest of the clan. The final piece of good news is that Tracey's Dad is now out of hospital. We didn't win the lottery whilst on holiday last week so returned to work today, and after a week like the last one it was good to be back! Its rare for Tracey and I to have a breakdown in communication but today provided one of those occasions. The arrival in the yard of one of the local militia squeaking that the white, not quite, rotten algae white van was impeding his progress around the hill to round up the woolly pie fillings grazing their hearts out prompted us to take action and move it from its resting place under the trees and place it in a rather more accessible parking space to await the scrap man. The militia man was an extraordinarily bad quad rider as the gap between the mucky panels of the van and the fence was big enough for any of Eddie Stobart's trucks to handbrake turn into, but for the sake of inter community spirits we would move the stricken van before the locals turned up with pitchforks, clubs and burning torches to deal with it themselves. Having tried to push it all on my lonesome I conceded defeat and reversed Rene up to the dead Toyota. Tow bar to tow bar I attached what I considered a suitable tow rope between the two, they looked like competitors in a mechanical tug of war. Tracey came to inspect my handy work and opted to drive Rene which meant I was lumbered with being towed backwards in a van full of spiders. The tow rope I had chosen for the task was a horse leading rope, which at best is five foot long, with the knots to link the two vehicles it was shortened somewhat but I was sure we could manage. What I hadn't counted on was Tracey not having towed before, but as my parting words before sealing myself into the white container full of arachnids was "No faster than four miles an hour" I thought I had made myself quite clear. The distance to be covered was some three hundred metres of dirt track, mainly downhill, a slight right hand curve if travelling forward and a huge ditch on one side and a large stone wall the other. The scene was set for a smooth transition from one end of the smallholding to the other. 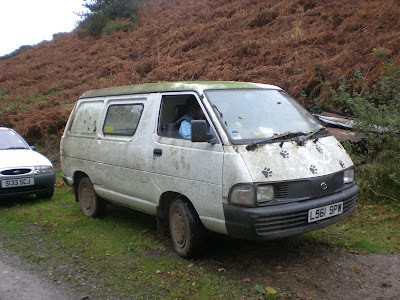 The slack was taken up, the van jolted, metal groaned and the Toyota started to move backwards as planned. My world suddenly transformed, much like Han Solo's when he hit "The Button" in the Millennium Falcon and jumped to hyperspace except mine didn't dissolve into a blur of stars as I travelled forward at light speed, no mine jostled and blurred into a rush of green and brown autumn leaves as the sides of the lane rushed by. I'm not proud, I screamed in panic, we were travelling considerably faster than four miles an hour, this felt like forty and as I fought the G forces and struggled to turn and yell out of the window whilst simultaneously standing on the brakes, pulling the handbrake, putting the van in a forward gear and most importantly of all steering the unguided missile I was sitting in. All the while Rene with its four wheel drive pulled resolutely and my universe continued to accelerate away from me backwards. Finally the combined effect of brakes and gears dug the wheels of the van deep enough to persuade Rene to stop. I fell out onto the safety of the dirt track, my world suddenly moving the way I wanted it to. Tracey was crying in the four by four Renault. Tears of laughter were falling down her face. Between bouts of hysterical laughing she managed to explain that she had never towed before so when she looked in the mirror and saw how close the back of the Toyota was to the back of Rene she had tried to accelerate out of danger but it didn't work, the Toyota followed her. When I asked if she heard me screaming this prompted fresh roars of laughter as she agreed she had heard me but mistakenly took my cries of terror as shouts of encouragement. Having realised that she was driving the automobile equivalent of conjoined twins and no matter how fast she tried to get away the Toyota would follow she slowed down and friction eventually prompted a safe stop. My ruffled feathers were soothed with a cup of coffee but my day has been punctuated with bouts of unexplained laughing from Tracey. Its almost as if she remembers something funny! We took the boys for a walk today, determined to shake the melancholy mood that has been hanging over Rock HQ, so set off down the track to Worzel Wood and along to the river. Apollo seems to have got over his fear of puddles and happily waded across the ford to the lush grass the other side. 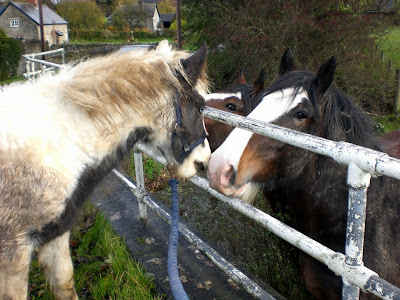 The horses spent a few minutes munching before we turned them back towards Rock HQ. 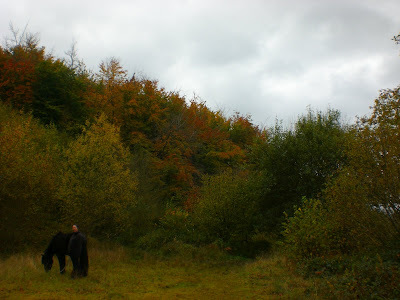 We stopped every now and then as the colours of the woodland were quite simply amazing. William doing what he does best, eating. 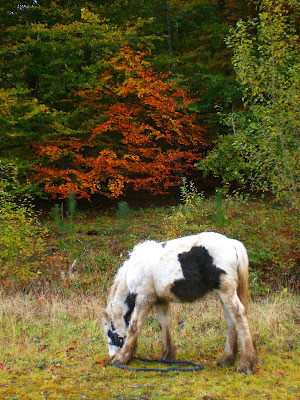 Apollo is a close runner up in the speed grazing competition. Back at Rock HQ we set about the jobs list, wood got sawn, chopped and put away, the Focus was started and driven up and down the track (we still haven't been able to sell this car! )Animals were cleaned, cleaned out, fed and watered. Sandy has, we think made a full recovery but for the time being he is confined to barracks with Daffodil and Bonny as stablemates. Apollo has taken the woolly invasion of his stable very well and last night was curled up asleep with the three Ryelands curled up around him, they looked like a Nativity playset. Oh the times I wish I had the camera with me! While Tracey and I worked the dogs sloshed up and down the lane and shared their mud enthusiastically with walkers. One of the local militia turned up and got a bit waspy as he couldn't get his quad bike along the lane as our Toyota van has died and partially blocks the track, we managed to translate his squeaking, he wanted us to move the van as he was in a hurry to get around the hill as they were rounding up the sheep, hopefully not for pie fillings. The van hasn't moved for months but with a team effort and more squeaking from the militiaman we managed to shift it, he still managed to get stuck so we had to pick the quad up and carry it the final two feet. All in all its has been a very good and very productive day, one that has lifted our spirits. I did at one time get a strange feeling like I was being watched. Funny what you find lurking in the trees here!